At May 2 we celebrate Inter National Scrapbooking Day and we thought it would be nice to say everyone why we love scrapbooking. Simply, some breathtaking words from our DT! Dziś obchodzimy Światowy Dzień Scrapbookingu I pomyśleliśmy, że byłoby miło powiedzieć Wam dlaczego kochamy scrapbooking. Po prostu kilka cudownych słów od naszego DT! I love scrapbooking because work with papers and additives always makes me happy, it's my way to spend my free time. It allows me to express my feelings and save the memories of our life on scraps and in mini albums. Because it allows me to express my feelings, my creativity , through pretty papers,stamp, stikers and so many other things .. while creating beautiful memories for my family and especially my children. Today it is more than a passion that has become a need, and it doesn't go a day without scrap ! Mmmm... I like scrapbooking because it's connected to tons of beautiful stuff such as papers, patterns, flowers, ribbons, mists, colors etc. I like surrounding myself with such things and working with photographs and creating this beautiful mess. That's probably I LOVE scrapbooking. Scrapbooking allows me to express my artistic side ... Which is graphic and photographic attracts me ! So it's natural that I came to this creative hobby ... And happiness , all styles are possible ! I've been scrapbooking for more than 6 years and I discovered that it not only fills my free time and helps me preserve great memories but it also made me to take pictures of everyday life and small details. Scrapbooking made me more sensitive for small things. I realized that happiness do not always depend of big things. Sometimes being happy means living a moment. So, to me it's not a hobby anymore - it's life changer. Scrapbooking for me is a therapy! When I need to load the batteries - there it is disconnecting me from the world outside, when I am happy - there it is helping to remember happy moments, when I am blue, there it is with my previous mini books full of sunny stories! It is also fuel for my self esteem cause it's always nice to receive positive comments about Your work! It is the bridge connecting me to the international world, it's hobby that can build the friendship between two strangers! Scrapabooking is Fun! If you also can write two or three sentences about THESE special thing(s) you love in scrapbooking it would be awesome [please use English language and comment below]. 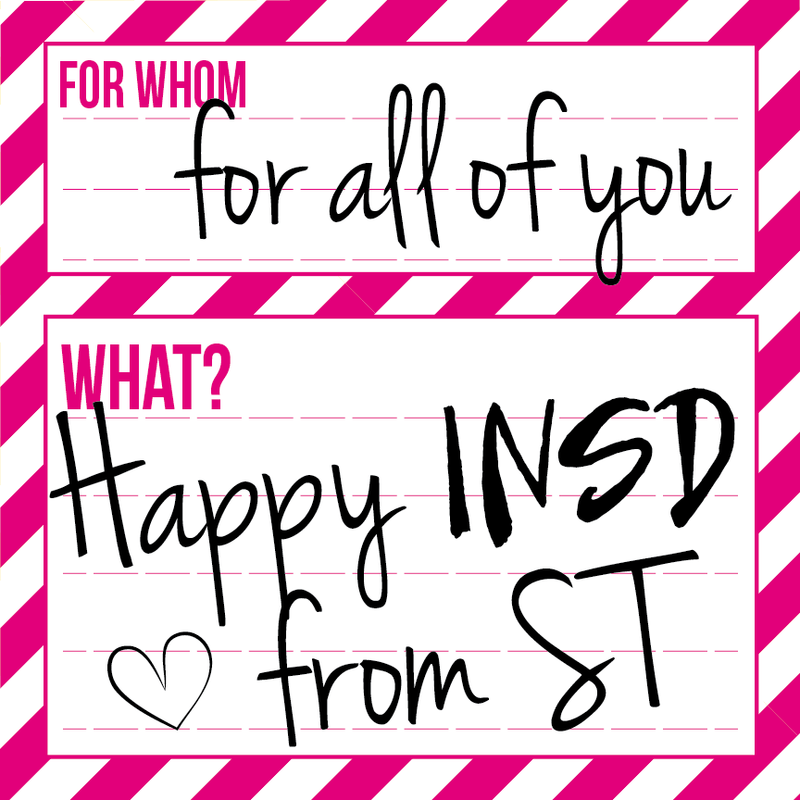 We will choose the most perfect reason and we will give this special person big pack with ST goodies ♥ Let us know why do you like/love/adore scrapbooking! You have time to Monday (May 4). Have an amazing weekend! Jesli Ty też możesz powiedzieć nam dlaczego kochasz scrapbooking będzie cudnie! Napisz nam kilka zdań w komentarzu (po angielsku), a w poniedziałek 4 maja wybierzemy jedna osobę, która otrzyma dużą pakę z naszymi produktami! :) Daj nam znać dlaczego scrapbooking to jest to! ♥ Miłego weekendu kochani! As I repeat this morning through a layout, scrapbooking is an art and more specifically the support of our emotions in colors .. that's what I like and that's why I like to me dirty fingers , cut, to imagine, to my memories remain alive ! Scrapbooking allows me to make pretty stuff without artistic tallent and I love that, because I always want to create, but I couldn't find my way. It's my method to cheer up, to relax. I love that I don't have my photos just on computer, but printed on LOs and mini albums. And that I take more and more photos. I also love all scrapbooking goodies - papers, alphas, stickers, etc. And because of scrapbooking I met a lot of fantastic people. And I love scrapbooking because I even love my life more. Now I see all small things which are wonderful, but sometimes I don't notice them. Scrapbooking is the one creative hobby that I've stuck with for this long (going on 8 years). After I hit a low point starting throwing all my stuff out, it's the hobby that survived. I love the release, the play, it's not a hobby for me, it's a life-saver and it gives me a chance to preserve memories and stories in a fun, artistic fashion. It makes me smile. I love capturing memories of precious animals people and things forever. I will never change this to anything and I hope to teach my offspring to scrapbook too. When I found the first information about scrapbooking (it was about 5 years ago), I didn't think it would become something big and important for me, but now it's one of the main parts in my life. Scrapbooking gave me an opportunity to express myself, to show my emotions and not to harm people around me, it gave me an opportunity to be emotionally free, to solve my problems with the help of art. Also I found new friends, who are always happy to see me, whom with we can talk about our little strange things (strange for other people) - about glue and paper, challenges and worldwide scrap-ladies, it's awesome feeling, when you understand, that people understand you. Now scrap is much more than just a hobby for me, it's my way to express myself, to get harmony inside, my way to find new friends, to be happy and now I can't imagine my life without this art, it makes my life as full and positive as it is now. Hello me why I love scrapbooking. because it allows me to channel the overflow of energy I have.